The elevator is simple in design and few in part count but involves a couple of tricky fabrications. One characteristic of the D.VII is the uniquely rounded tail group. 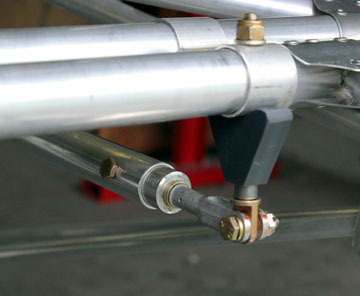 It is necessary to bend two trailing edge tubes to identical shape. 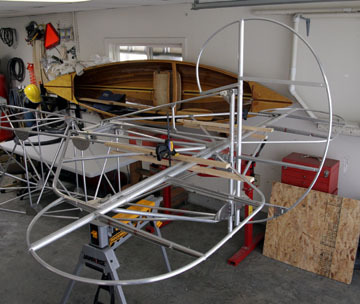 Each tube has two bends, one large and one small radius. 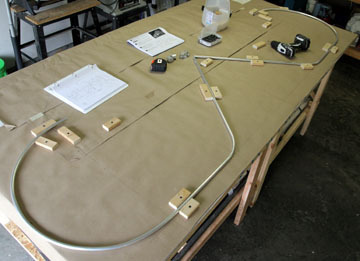 A 14" diameter bending form (the same size as a plastic 5-gal bucket!) was used to make the bends. Technique involves flexing the tube until you barely feel it give, then move forward 1/2" and flex again. The radius of the bend depends on how aggressive the pulls are and how close together each pull occurs. 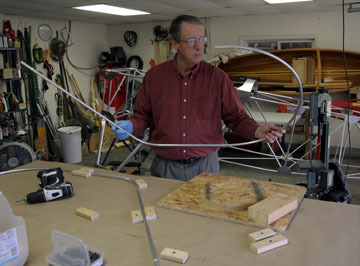 Care must also be taken to assure all bending occurs in the same plane so no twist will be built into the surface. 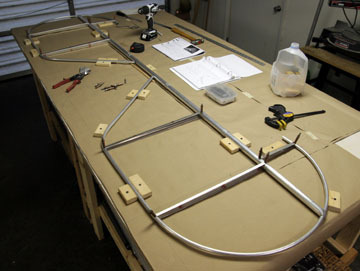 A half-hour of careful bending yielded two trailing edges that are identical in shape. 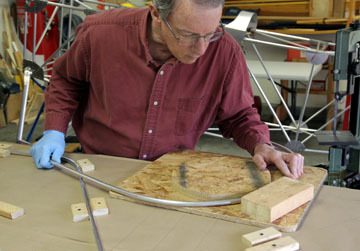 The ends of the elevator spar are drilled and coped to accept the trailing edge. It is very important to slide the hinges onto the spar before machining the ends of the spar otherwise they may not fit over the coped ends. Here is the elevator with the ribs fabricated and clecoed into position. I put the horizontal stab layout sheet on the bench and used it to size the elevator. 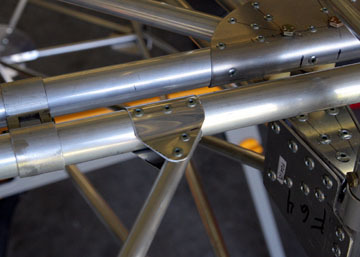 The plans call for flattening the trailing edge tubes where they join the spar, bending them at a 45, and riveting to the spar. I don't like to flatten and bend tubing because it can promote cracks, so I secured the tubes with gussets. Here is the elevator horn which consist of a spacer and AN4 eyebolt.